What's wrong with the New York Open? The inaugural NYO has been absolutely poor in getting people to actually go watch the live matches. Yes, it's the early rounds of a 250 tournament, but even in Isner's and Nishikori's matches on the main stadium, there were few in attendance. A sea of empty seats with two or three people here or there. Not to mention that they also sealed off the top balconies. Might as well not even relocating it from Memphis. So what is it? Lack of big-name stars, promotions, ticket prices, location, etc.? Also, why are all the ball boys/girls wearing XXL-sized shirts??? Sad to say but Tennis just isn’t as popular here as it used to be. its a trash tournament. the courts look ugly. the stream is legit terrible. I've seen video game streams for super smash melee have a better stream off a 4g iPhone. The quality of the video stream is probably irrelevant to the poor attendance. Most people don't check out the ongoing matches on a computer before they decide whether to buy tournament tickets. They make their choice based on the reputation of the event, who is playing, and whether they like watching live tennis. Shouldn't have moved it from Memphis. No one there, bad feed, bad looking courts. Icing on the cake is that the Nike guys are all wearing drab black / grey outfits so there's zero color on tv now half the time. Memphis used to look great, excellent audio and packed stands. Terrible move for ATP. It's not the best field but the attendance appears absolutely dreadful. Probably just general lack of exposure of being a new event and not well known and also being a lowend 250, not like the Kremlin Cup or any other comparative 250 has sell out stands either. Just to point out half if not all in attendance at matches like this are probably player's guest house family, people who will give lodging to players who don't have the cash for better. The people in Memphis appreciate it more. New York has everything already. I dont understand it either. The ATP is probably regretting the move in hindsight. Memphis isnt very far from Nashville. Lots of tourism there with the smoky mountains and all the music heritage there. I am watching the dubs now on the TC and they improved the LIVE feed. Also if the tournament was doing so well in Memphis, why no tournament sponsor and declining revenue? Literally feels like a challenger, nobody in the stands, poor video quality, etc.. It was a poor decision to move the tournament to NY from Memphis. Memphis just seemed like an ideal location. Numerous local college players and rising players from the area got wildcards into the main draw or qualies. The tournament was great. NYC already has the US Open, why does it need some 250 there? Giving a city like Memphis a 250 was very smart, because there's a good crowd there. In NYC, nobody could give a rat's about anything other than the open. Why would they have this in New York when NY already has a slam? As a native of Nashville, it's overdue for a great sporting event like a tennis tournament. I'd love to see it have a 500 level leading into the US Open Series. Those green rolling hills with either puffy white clouds or dark grey skies. It's beautiful either way. Yes, its beautiful there. Been on vacation there a couple times. Plenty of stuff to do too. That's one of the great things about the south. The south doesn't take great events like that for granted. People are going to show up. They'd also bring in your face hospitality along with an aesthetically pleasing venue. I'd love to see it. It's why the Masters golf tournament is so well done in Augusta, Georgia. Tradition, class with a genteel southern character. Nassau Coliseum is in the middle of Long Island and I'm pretty sure it's a pain to get to. I've also read that ticket prices are insane considering the players in the draw. No longer live there but my heart belongs to Nashville. If a tournament moved there I’d go back for it. Could be just a matter of time. City is red hot. Wait, what? I missed this - thanks for posting. Potential Isner-Goffin maybe or Sock-Goffin. Good stuff. If the guys can rally around the flag there will be some good matches. Isner’s had a tough start to the year. It’s mainly this. There isn’t an easy way to get from Manhattan to Nassau Coliseum. You’d have to take a train from midtown Manhattan and THEN a bus or taxi. Would take close to two hours. The US Open on the other hand is only 30min away and a 5min walk after you get off the train/subway. The crowds have been thinning down for all events in the USA other than the USO - we saw very low turn out in San Jose, LA , Memphis (ATP/WTA), San Diego (WTA) and all events went belly up. That is the reason for the NY move. Even Washington 500 event has very low turn out during week days but given 500 points are at stake, you have at least 2-3 top 15 non USA players wanting to participate. Also if the tournament was doing so well in Memphis, why no tournament sponsor and declining revenue? Yes, everyone is simply ignoring this point. You don't just assign a tournament to a city that's pretty and/or hospitable. Some organization has to be willing to put up the cash and other resources to run it. What was the great deal in Memphis that the ATP foolishly rejected? This is not to say that the NY version will succeed, of course. The tournament may just be doomed. The Memphis Open was founded in 1976, but ran into financial problems in recent years. Top players, in large part, began to avoid the event, which featured stars such as Bjorn Borg, John McEnroe, Jimmy Connors and Arthur Ashe in its heyday. Attendance then began to sag, and the tournament failed to find a title sponsor. This tournament should be on the West Coast. The LA OPEN at UCLA was great tournament for decades - big crowds, well run, good sponsorship. The ATP dumped it in 2012 and moved it to Bogata - why, who knows. They claimed they we’re having trouble getting the top players. Their July dates were positioned close enough to the end of Wimbledon and far enough from the beginning of the U.S. Open to make them prime time for players to stay home. The support for tennis and Southern California is very strong and always has been. This tournament was in LA since 1927. Why not move this tournament to the West Coast in the slot not too far away from the Indian Wells dates in March and move it indoors to an area like San Diego, Orange County, or the San Francisco Bay area and see what happens. I’m sure we do better than it will in Long Island. Karlovic is the only reason I'm watching. 38 year old handed Harrison his lunch. Yeah, and now they started with their draw rigging so players can win it without facing top 20. Seems like some rich kid inherited the tournament and doesn't even care. 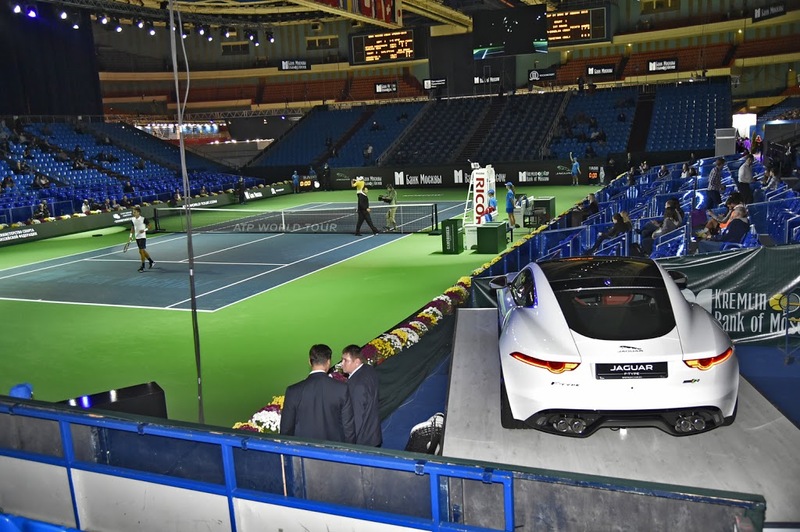 You can even get a free entrance for the first days of Kremlin Cup. My buddies went to this tourney.. they were giving away tickets to come back the next day?! * bridges... (any time you cross a bridge in NY, it's like going to another country... mainly cuz of the traffic gauntlet you need to get to).... NJ folks have to take 2 bridges! fuhgettabout CT folks, that's a U shaped (around the bay) 3h drive one way waste of time. I've been three times. You just buy the cheapest seats ($20) at the box office and they let you sit wherever you want, so I got six hours of courtside tennis for $20. The people who work there are cool and it looks great in person. But obviously no one's there - and I mean no one. What you don't see on TV is the back "grandstand" court (behind the wall of dark glass on tv) which literally has 3 or 4 people watching - usually friends/families of the players. It's the first year of a 10 year deal so they better figure it out. I think they will. People didn't know about it this time and many that did, thought it was an exhibition, which they used to have at the Coliseum and MSG a lot. The crowds have grown each day (not saying much, I know) and I think you'll see mostly full seats for Sunday's final if it's two of the bigger players. For those in the area, you should try to come next year. It's cheap and you just move around the arena and see tennis from several angles - all close up. can please have written consent to repeat an opinion as authentic and unique as “its cold”? I hereby publicly give credit to suresh for declaring “its cold” in ny. i’m so glad you told me, i’d have never noticed otherwise, despite actually living in ny. I’m pretty certain someone has used the phrase “I already said that” so please cease a desist using that phrase. It will be interesting to see the attendance over the holiday weekend. That may be a good barometer to gauge the future popularity of the event. Just proves nobody cares about ATP. Don't know why these guys think they deserve equal pay. tiafoe is playing tonight..whats the crowd for the young gun? or is he too unknown at this point? (age20 rank 80s). Fine unless you were absorbing the losses. They couldn’t get a title sponsor. “Well, here’s a quick question. Can you tell me the name of the 2017 champion? It would have been funny if Harry won the inaugural NY Open. Just proves nobody cares about other players other than Federer in USA. In Europe, tennis has no problems. It sure would have helped if USA could have produced a great champion after Roddick. Haven't posted here in a long time but was interested in what's going on with this tourney. all the reasons everyone posted are correct, and my input. I live about 15 minutes away, played most of my life, and even I'm not interested. prices online are like $70 and I didn't know about the $20 box office or might have gone. let's also remember the Coliseum is a s-hole although I haven't been there since the alleged "renovation." but people running this did not promote it well and priced it too high. also, the # of people who are actually interested in tennis in NY is extremely small. yes, the Open gets huge crowds of NYC folks and corporate tix, but most come for the atmosphere and to walk around outside during a nice warm day and know or care nothing about tennis. as for getting to Uniondale in February, with high prices to see not top level players, forget it. this thing was doomed from the start. and did I say it's cold out?